The terrific sound of AURALiC’s first VEGA digital-to-analog converter made it an instant hit when it was released, and this year’s upgrade to the original definitely lives up to an impec-cable sonic standard. 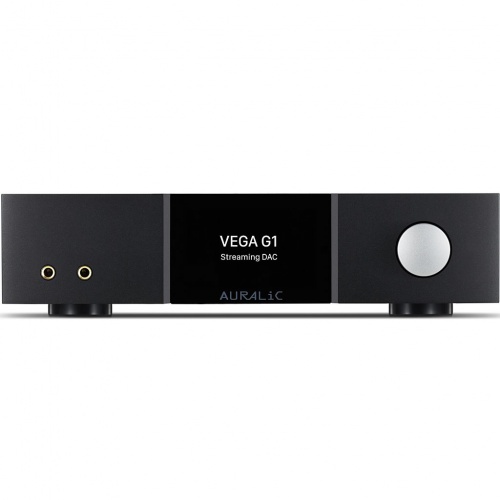 But the VEGA G1 Streaming DAC goes a lot further, with integrated streaming functionality and a host of improvements that are, once again, drawn from AURALiC’s top-end lineup. Last year AURALiC introduced a terrifically innovative DAC feature, wherein those resources of the Tesla platform allowed it to handle incoming data in such a way that the DAC didn’t need to lock on to the frequency of the source signal at all. It could actually operate independently of the source signal’s frequency, thus rendering signal and synching errors — and their result-ing jitter — completely irrelevant. That independent, Jitter-Free Operation has also made its way into the G1, highlighting AURALiC’s commitment to this creative solution to one of digi-tal’s biggest challenges. When it comes to signal conversion, VEGA G1 turns to the same customized DAC chip that AURALiC used in the G2 version, and the G2’s super speedy 72fs Femto clock is here too, taking care of clocking duties for impressively precise signal handling. 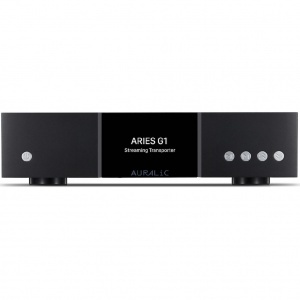 On the analogue side, ARIES G1 sticks with the ORFEO Class A output module that has been impressing fans for years, and a set of Flexible Filter modes that experienced users will find familiar returns. Once again the upscale G2 line’s influence is evident in the VEGA G1’s appearance. Housed in black anodized aluminum with a silver rotary knob, the G1 features the same 4.0-inch true color retina resolution display that figures prominently in the G2 line. 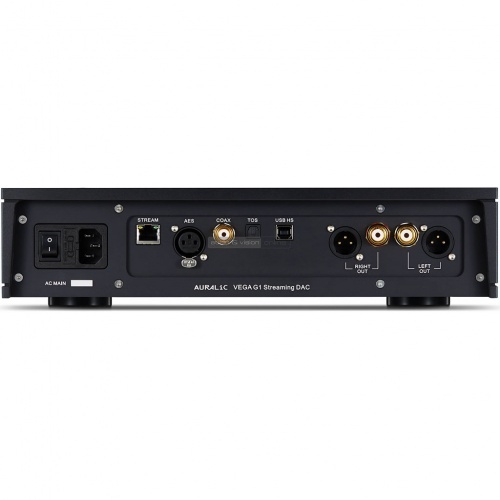 And there are plenty of options on the back of the unit for hard connections from other digital source components if you need them: AES/EBU, Coaxial, Toslink, and USB HS are all available in addition to the Ethernet port for network streaming. VEGA G1 supports both streaming and conversion of all of today’s highest-resolution digital music formats, up to DSD512 and PCM in 32bit/384K, and it stays up to date with OTA updates from AURALiC. Lightning Streaming is the foundation for VEGA G1’s streaming functionality, and as always that means On-Device Playlists, Memory Caching, Gapless Playback and Bit-Perfect Multi-Room features are part of the package. The Lightning DS control app for iOS supplies all playback and browsing features, and there’s a web admin for setup and con-figuration. VEGA G1 also supports Spotify Connect and Roon-Ready features. 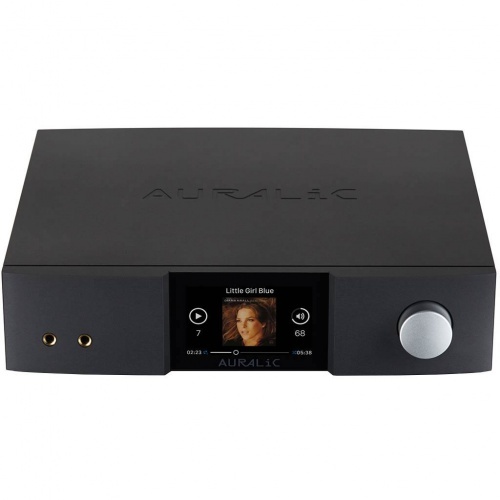 Founded in 2009, AURALiC LIMITED has established a worldwide reputation for creating innovative digital audio components of the highest quality. AURALiC’s elegantly-crafted products combine classic analogue designs with cutting-edge digital technologies to blaze pathways into the future of high-end audio. AURALiC’s seamlessly integrated hardware and control software provide effortless command of high-resolution music playback throughout the home. Whether streaming from Internet services or local music collections, AURALiC components let you discover, share and connect like never before, expanding the horizons of your audio system with new levels of functionality and performance.